I read a lot of running forums and do try to take on advice and suggestions but much of the time I plead sheer ignorance and carry on regardless. Last year when my left foot hurt, I refused to acknowledge the pain until enough was truly enough and my physio friend had arranged an appointment to see their colleague. The result of the pending examination was a weak left hip that was causing the pain in the foot, as that was now taking the entire strain of running. Now on recent podcasts and twitter pages the talk of getting an M.O.T for your body by visiting a physio has been mentioned. And when you think about it it makes sense. We as runners take care and time picking our running kit, checking our pace, Heart rate etc but we lack the interest when it comes to checking our biomechanics are up to the job of getting a regular pounding. Physios can often spot issues before the pain factor come into play. I went to one as a pain in my right foot this time had occurred. The result was tight calves but also he spotted a weak right hip, which if left untreated could cause a magnitude of issues in the future. So to some up… If you run, then spend money on a Physio to check your posture, muscle fibres, hips, basically a M.O.T. It is well worth it. It’s no secret but I love money. 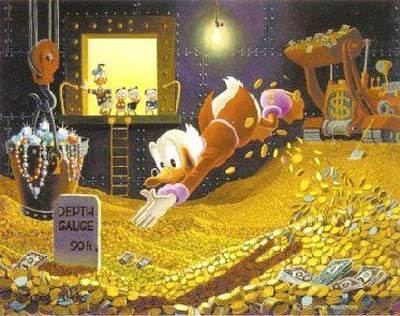 If it wasn’t for the fact I choose to lock it up in a bank then I think I would have a whole room in my house dedicated to the coins and notes and like Scrooge Mcduck I would dive into it. I am a little bit like Scrooge, I have several accounts and investments and am always checking my funds. I will buy rubbish, and spend a lot on food and drink but for other items I spend ages arguing with myself if I need the item. So this pair has a hole in it, the rain isn’t getting my feet wet, I will wait until the sole falls off before I buy some new trainers. Once when I had some money from my Nan, after she passed away I chose to buy a new telly and sound system. Eight months it took me as I was so attracted to the idea of the interest it was earning in my ISA plus the fact I was continuing debating if I needed a new telly and whether I could justify spending 400 smackers on one. Even if it was something I needed, like a new computer for work, or a winter coat I would still find excuses why I couldn’t raise the funds or rather a more accurate description would be finding a reason why I couldn’t be parted with my wealth. The reason for this blog, is I have just got paid from the job I am doing for 2 months and straight away I placed half the wage into a savings account. I do blame my dad for this and also thank him. He would always be careful with money and the pocket-money we were given was tiny. We all had bank accounts from an early age to encourage us to save. For Birthdays, and I’m talking 13 onwards if we wanted something big like a Mega Drive then we would get Birthday money, not enough to cover the cost of our desired gift the rest we would have to find ourselves. I do think back and thank him for this lesson, I had a pension when I was 25, I have savings coming out of my ear and before I got my car, I had a very nice nest egg. Being freelance, I need to put money away for those days I’m out off work and plan ahead. I have accounts to pay for car insurance over the next 2 years, car repairs accounts, accounts that if my freelance career stalls I can live for 6 months before I need to get work. Basically I am a saver. I have a credit card but I pay the balance off in full, I have not gone over drawn since my uni days and always aim to have at least a thousand in the current account. I won’t get on to those people who spend money that they don’t have, or who are spending my savings. But I will say, that having money does bring you happiness. I know that when others are finding it hard to live i will be able to draw on my savings to live through the tough times. A little evil I feel, but don’t blame me for having the foresight and a father who taught me the value of money and who himself grew up in a time where if you wanted something you scrimped and saved. This is a short story I began a while ago, not sure where it was heading to. The year was 1872, and the call out was the country manner. I didn’t know what I was being called out to, none of us did. The manner was a place you wished you never got the call from, partly because the person on the other end was deaf, so it proved to be a difficult conversation. Plus the telephone was not to be invented for another four years, and the string connecting the tins often got tangled with people passing by. I was sat in my office, which I always thought was a useful place to carry out work. It had my desk and a chair. I was saving up for a filing cabinet, but for now the office suited me. I shared it with my sergeant he was a young man by the name of Clive. He had been promoted through the ranks since he joined the force he always reminded me of myself in my youth, as I to was promoted through the ranks, I also thought it would be easier to step into the breach of Detective but the trousers were always made for the more rounded gentleman it proved you needed to serve your time to grow into them. It was as me and Clive were typing up our notes of the Bosworth case that the knock on the door happened. I as I always did ignored it, Clive on the other hand quickly opened, to find a tall slim lady standing on the other side. She quickly moved out of the way, as she was just passing by. In her place was Michael Peel. Peel was the office clerk the man who filtered the calls answered the post and picked the milk up from the corner shop for tea break, sometimes if he was feeling generous he would even pick up some biscuits. Peel always behaved as if he was the power behind the force, that without him, we wouldn’t be who we are. “New case for Detective” I again ignored him. I still hadn’t forgiven him for buying ginger knuts. He knew I hated ginger knuts. In the awkward silence that followed Clive stepped in to break the tension that was growing. It was at this point that I started to listen. I needed to interject, but I thought I would allow Clive to investigate. “A note” I could not contain my silence I butted in and continued the conversation with Mike. “ Well thank you Mike that will be all. We will deal with it now” With that I ushered him out of my office, and shut the door on Mike’s face. I returned to my seat behind the desk as that is where I had left it, and it always seemed a good place to keep a chair. I sat down, and turned to Clive. Luckily for Clive and I Mike had left his coffee cup on my desk, on his return I asked him where the location of this missing murder had been. The answer that Mike had replied made me sweat with fear. I called for Simon, my trust horse. I told Clive to man the desk and wrap up the last case. He gave me a puzzled look, for some weeks now he had tried to make me choose a different present for my wife’s birthday, I being stubborn disagreed thinking that a nice brown suitcase with golden buckles would be a wonderful 50th birthday gift. The pathway up to the old manor house was dark, my intelligence had told me that this was due to the the lack of gas lamps to light the way. I was luckily enough to have a spare candle on my person and with a strike of a match I illuminated my path to the door. I banged the large door knocker, a recent invention that saw a NoBel prize for it’s inventor. The sound reverberated around the my head, and from the last drones of the banging that echoed came foot steps. A young boy slowly opened the door in his pyjarmas I thought it was a strange place to have a door but the thought quickly past as I needed to speak to the house keeper on urgent business. This made my day. All to often I have faced the daily dread of this public transport system. TRAVEL | Manchester man makes the perfect tram journey. Well I have ticked the category that says ‘running around’ but as the title suggests there is not much of running around. I seem to have runners block and have no idea why as when I finally get out on to the pavement I enjoy it more than ever. I think in the old days it was a matter of a 20 minute run but now it’s a case of an hour out of the house, and routes are becoming boring and even harder to find long distances. While Manchester is a large place, the miles you cover are very small. My house to Didsbury is only 4 miles, but you would expect it to be longer. So as I extend my miles each week, trying to find routes that cover the increasing mileage while preventing running around in circles I find myself becoming disinterested. This morning for example I should be going on a long run but am sat watching telly in bed. I will go out at some point but at the moment am trying to find my enthusiasm for the sport. I do hope that this is temporary set back, especially with my running diary that is slowly filling up. Well I am now filling in at my old place of work where I have started a two month contract and even before the week is out I started looking for another job. I have found said job, and all I need to do now is fill the application form out and that is the hard bit. I can’t even go for a run to think about it as my right foot is a little sore which I find hard to believe as the last week was hopeless in mileage, I only managed to do 6.5 miles on Wednesday, 9 on Thursday and a Fartlek session off 3 miles on Friday. This lack of running was down to the world of theatre that keeps you hostage in her dark clutches while she spins her web which slowly forms into a new show for the public to enjoy. Hopefully from next week I will be back to having normal hours rather than 14 hour days. However the week and the start of the job has made me realise finally that I no longer want to be in this game and be played with by the evil trappings of theatre and therefore while I have a steady 2 month contract I am making an effort to change my career to hopefully a job that I will enjoy and have more chance to climb the ladder of success which so far I have failed to even mount any of the runs that is over looked by her beady eyes. As always I will let you know, but will forget, until maybe I get the interview. The trouble with me is I’m quick. I’m no Mo and am certainly not going to come first in any 5000m especially when my PB for that stands at a mere 8 minutes behind the world record at what I and many of you may consider to be a speedy 21 minutes. I have trouble slowing my pace down. When training for the my first half, I’d be running 7, 8, 9 and even 10 miles at my 10K pace and no matter what I did I couldn’t slow it, the other trouble I have is doing too much too quick. I ignore the whole 10% rule and while training for the Great North I did a 6K one day only to jump up to a 10 miler by the end of the week. Well after taking a week off to some very angry inflamed muscles, I followed my compulsory rest period with the same mistake. So it seems I can’t slow my pace, but I also can’t control the time it takes to increase my running distance. Well today was a result. In fact up to now my Marathon training, while maybe not increasing by 10% has been increased by a mile a week and today saw me run at a slow pace off 30 seconds a minute slower than I have been. Thats around a 9 minute mile. Still not fantastic as they say you should run a minute slower than your marathon race day pace, I must say I felt very relaxed and comfortable and enjoyed it greatly. The trouble was I went and ran 15 miles. That’s a jump of 4 miles in a week. But now with my new pace it felt good, and so far there’s no complaint from any of the major muscle groups. Next week I must reduce it again, and then maybe ramp it up. I think the weather is to blame for the distance as it was that January winter sun, on a frost covered pavement with a stunning blue sky that echoed a slight chill only to be warmed by the glow of the sun hovering about the city making Manchester glisten. I must admit while I feel fine, I should have put a cap on it, as I am working all night tonight and won’t retire to my bed until 6am Sunday morning. Maybe when I wake on Sunday will be when the muscles decide to begin their revolt. We will just have to see.